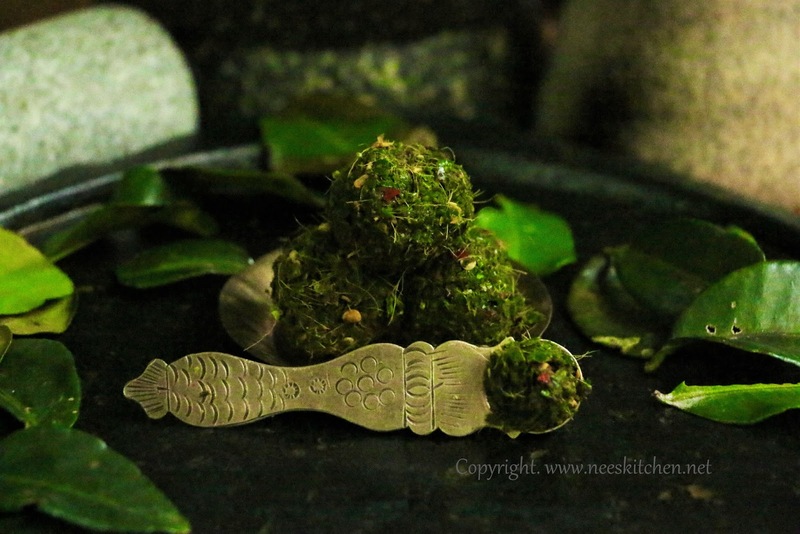 Onam is next week and here is one healthy pickle which is traditionally made in palakkad - Vepilakatti. This is one of my favorite pickle which is made out of bitter orange leaves (Naarthangaai). Lime leaves, curry leaves, roasted dry chili,small onion, tamarind and hing are combined and blended as a coarse paste. They are then made as small balls for consumption. Since we do not get this leaves in most of the places I altered to use Kaffir Lime leaves and it tasted the same way like bitter orange leaves. I have also tried earlier with lemon leaves and it turned out to be good. Kaffir Lime leaves are used in Thai dishes.It does not contain oil and can be preserved for 2 or 3 weeks in refrigerator. 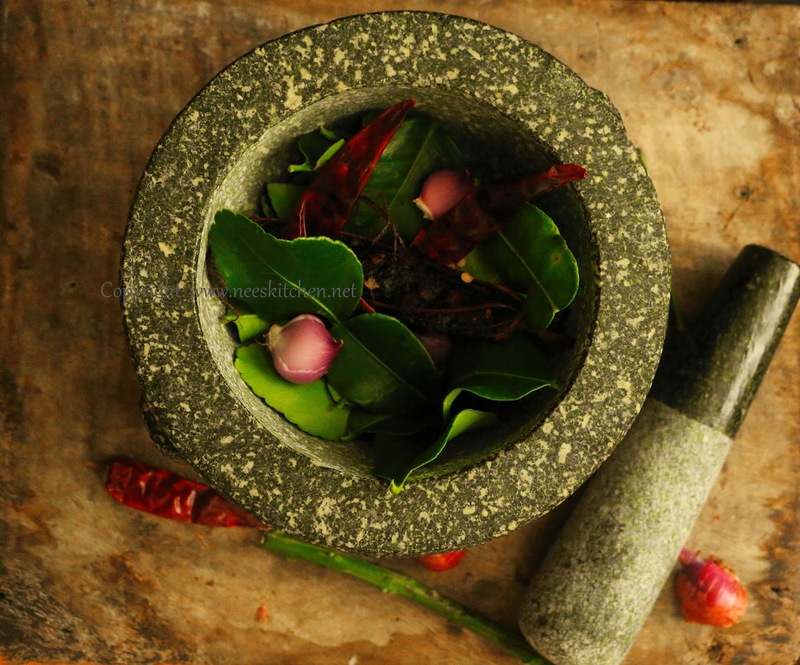 There are 2 ways to do it, one is using the mortar pestle and other using a regular mixie. Mortar pestle needs lots of patience and time but the taste is definetly good. This is my old post and I tried this recipe again as one of my good friend and travel blogger In Pursuit of Travels presented me this mortar. I also clicked some new pictures to make this post more beautiful. 1. 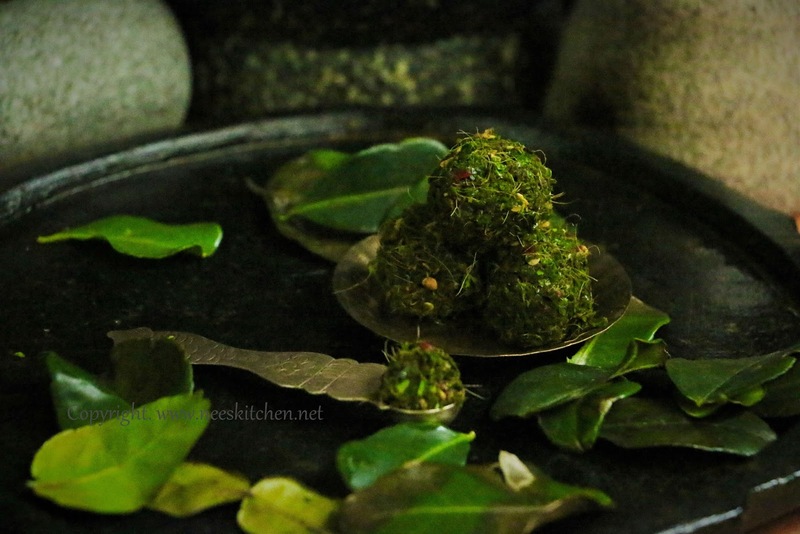 Wash the Kaffir lime leaves & curry leaves, pat them dry. 2. Dry roast the red chilli until they turn crispy. 3. Tear the stem of the kaffir lemon leaf. 4. Add all the ingredients and grind them in a mortar pestle to form a nice paste. (You may use the mixie also in that case triple the quantity). 5. Pictures taken at various intervals during grinding in mortar. 6. If you are using a mixie. Add all the ingredients with more quantity and blend well. 7. Make them as small balls and store them in an airtight container. Sprinkle the pickle over the curd rice & enjoy. Tamarind can be replaced with lemon juice. 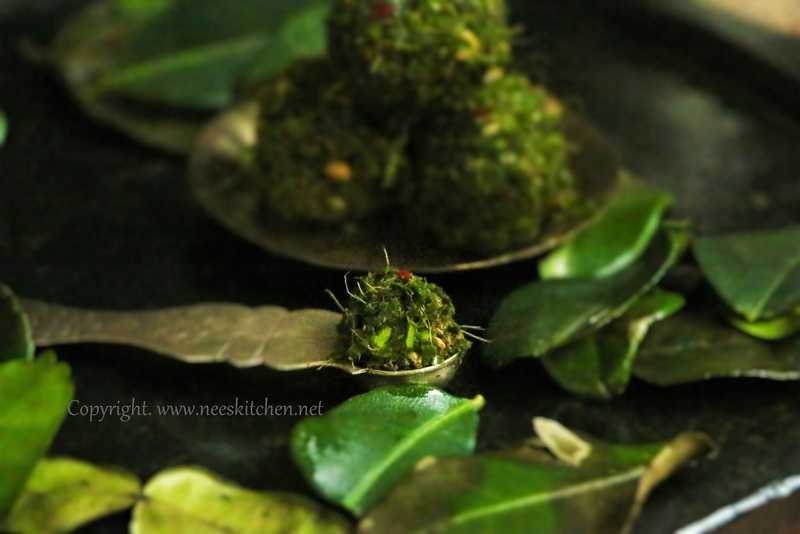 Curry leaves must be half or lesser than the quantity of lime leaves else it will override the lime leaves taste. I used mortar pestle and it took around 45-50 mins to do this paste. The time varies based on the experience. You may use a mixie to finish it faster. Mortar pestle definitely gives a better taste than mixie. Chili can be roasted with little oil if needed but it tastes good without oil itself. Adjust the number of chili's as per your taste the above one is a medium spice. Mine is not a complete smooth paste as we like this way to eat. You make it as a nice paste also.